You have been chosen to lead an elite crew of Pod pilots who will delve below the surface of Mars in Solarus Corporation’s first major drilling expedition. Super Motherload delights the senses and challenges spatial relation skills for 2-4 players who love videogames, euro-style boardgames, or deck-building card games. Easy to teach! Video tutorial available online! Gameboards are added and removed during play to create videogame-like scrolling action! If I were to ask you to translate a videogame that resembles the lovechild of Spelunky and Dig Dug, and then asked you to turn that into a tabletop game, would the first mechanic you think of to suit it be ‘deck-builder’? Because the folk at Roxley thought that would be the perfect fit and y’know what…they were kind of right. Super Motherload forces you and up to three others to form an elite team of miners in a bid to hollow out Mars all for gloriously valuable resources. These include iron, gold, platinum, emeralds, rubies, diamonds…and bombs. Because that’s what we should be looking for on Mars. Gems and explosives. Can’t see what all the fuss is about with flipping water. All players start with 7 cards, 4 of which enter their hand straight away. They also have a market of cards that they can purchase throughout the game, personalised for each faction (one of which including Laika the dog! She lives! On their turn, a player can do one of three things. The first is picking up two cards in an attempt to strengthen their hands leading up for the second action, drilling. By playing cards of the same colour; red, blue, yellow or RAINBOW, players can plough into Mars. Counting a series of drill icons together on each card, equalling the amount of distance they can make digging through the board. If they go through any resources on the way, they gather those up and place them onto a card in their market. If the value of resources reach or exceed its value, they add that to their deck. Of course, if you lack patience or grace your third action can consist of bombing if you have the right cards and explosives. Using a bomb means you can make an abstract shape in the ground. It’s like drilling, but sexier…I guess. Gathering that workforce is not only important for your deck, but for your honour. Each card is worth a certain amount of points. You can also gain points by obtaining ‘Major Achievements’, a set of goals that give players points for hiring certain sets of colours. Seeing as everyone is fighting over points for pilots, if these were the only way of obtaining victory then Super Motherload would be little more than a slightly complex race game. However, it’s ‘Minor Achievements’ that ironically cause the biggest influence in preventing the game from getting tunnel vision. Minor Achievements are smaller goals worth less points that force you to rethink how you play the game on the fly. These achievements have a wide amount of range to them, from hoarding bombs, to power drilling five spaces, to spreading out gold in your market, to getting nine cards in your hand to making sure you have zero cards in your hand. These are small missions that test the optimisation of the workforce you’ve been building the entire game. They’re the tiny tasks that delve into mechanics of Super Motherload that you might not have considered using beforehand. Utilise these in ways that benefit you best and you will be laughing. There’s not an awful lot of back stabbing in Super Motherload. Every time you dig, it just leaves it open for other players to snag even more valuable commodities. Instead the game is one that wants you to focus on YOUR wants, YOUR needs rather than manipulating everyone else’s complex machines that they’re building. If you’re looking for a deck-builder to really sink your teeth into, I can’t recommend Super Motherload. It contains a lot of individual mechanics that, when put forward by themselves don’t really amount to much. If you’re looking for a meaty deck-builder that leaps from your hand onto a board, look towards the fantastic Trains. But the reason why Super Motherload’s deck-building is so simple is because it doesn’t have to be complicated. If it were any more complex the whole game as a package just wouldn’t work and it feels good to mine down into Mars. It feels good to grab a bunch of commodities. It feels good to hire these pilots with absolutely extraordinary artwork and it feels good to lay down a hand of perfect cards that you’ve accumulated through your absolutely astounding system and grab a bunch of achievements. If you’re looking for a great twist on your average deck builder, dig it up now. Super Motherload is an adaptation game from an old classic video game with similar name (Super Motherlode), somehow they made a pun about it in the game title. The game was designed by Gavan Brown and Matt Tollman (the architects behind Roxley Games) and they did a remarkable job. Super Motherload is a deck-building game with some twists. The game is no longer a pure deck-building, it also has counter-tile laying element that makes the game to be one of a kind out there (maybe one of few. not sure if there are other games with this kind) where you put tiles on top of something on the board to cover it up. What I mean, in most tile-laying game, you place tile to add something to the board, but in here, you place tile to cover up something. In this game, players take the roles of lead miners from different mining corporations to dig minerals on Mars. At first the game starts with 2 modular depth boards and players will add more board as they go deeper. Each player will have a starting hand of pilot cards (each player will have a unique card that represent their variable player powers. They also have pilot decks separate by type that they can buy along the game to gain more powerful pilots and bonuses. On a player’s turn, a player can take 2 actions and there are only 3 available actions that they can choose, DRAW, DRILL and BOMB. DRAW – unlike any other deck-building, in this game player’s hand doesn’t get refilled at the end of each turn. They have to use their actions in order to draw more cards. I founc this to be interesting, since the ebb and flow of deck building game provides streamline and simplicity to the core actions, it provides the opposite of that in this game. Without the limitation of player’s hand, the core action of the game will bring huge impact in crashing the tile laying flow of the game. Covering the board would not feel challenging without timing and tactics. So players need to carefully time their drawing actions. DRILL – Basically players, play cards to drill the soil part of the board based on the amount of drill icons present on the cards. They can only play one color cards (plus rainbow since it’s considered as wild) and direction of the drilling can only facing straight, they cannot change course to the drilling direction. They will place a black tile to cover up the spaces they had drilled and get rewards from those spaces. The rewards can be minerals (there are several type of minerals which has different value), special effects, bombs and artifacts. When a player receive minerals, they have to immediately assign it to one of the pilot deck. If the amount of minerals on top of the pilot deck is equal to or higher than the top card, that pilot card is bought and placed on the discard. Some spaces cannot be drill in normal way, they’re not soil but steel plates and rocks. Players may only drill steel plates by using the drill pilot of the same color and players cannot drill rocks. BOMB – Players can only pass rocks by bomb it. Bomb is related to one type of card (Red cards) and only one card can be played to take Bomb action. This action need a bomb token each time it’s used, the token works as a fuse or ignition for the bomb to explode. Each bomb card has a specific pattern that it covers, it’s like area affected by the bomb explosion. They have to be be able to cover all of the area in order for this action to be valid. More expensive cards will have bigger pattern. When players get artifact rewards, they draw an artifact token. These tokens provide bonuses for the players, that some of them can be used during the game. And when the last artifact on the board is taken, new board will be placed to advance the game. During their turns players can also claim achievements (limited to one major and one minor achievements per turn) from available ones. Major achievements provide points by collecting a set of advance pilot cards (determined from the setup) and minor achievement also provide (lesser) points by completing various conditions. The game ends when the last artifact from the last board is taken. Players now tally up their points from pilot cards and achievements as well as Artifact tokens. I found the game to be very simple, timing is very important and players basically racing to get the best minerals in the board but in the same time, everything they do will open up ways for their opponents. Because of this players sometime hold their drilling in order to get the best ones. The game also prone to AP, the possibility to get the minerals and how they hold themselves will offers them hard and dilemmatic choices. I wouldn’t recommend to play this with 4-players if there were AP players among the group. It’s definitely a good 2-players game. There are some chain combos that players can make by timing their actions right and buying pilot cards. Definitely a good game and my favorite. Super Motherload is a hidden gem, most people would miss in because the box is not a real shiner, but it has good replay value, the components are great and it is really easy to teach new people to play it. It has no real faults, and this is rarely said about a game – most of the players complained only of the icon legend listed on the back of the manual – Roxley could have made few copies of the sheet for each player, but it’s nothing as by the second game you will know all the icons by heart. 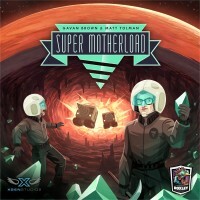 Add a Review for "Super Motherload"